Steven (Chicagoland, United States) on 18 August 2015 in Architecture and Portfolio. The L.Y. Schermerhorn residence spotted on Scottswood Drive in Riverside, Illinois. 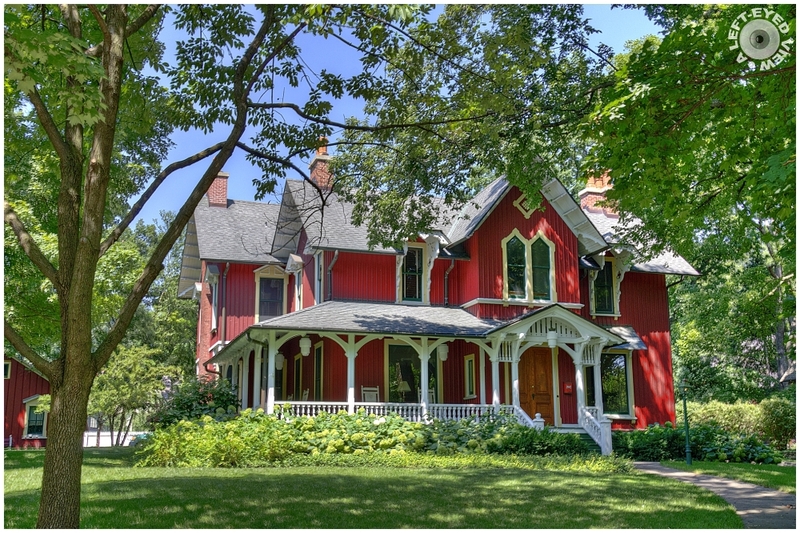 The residence is a Victorian-style structure designed by William LeBaron Jenny. Schermerhorn was a partner in the engineering firm hired by the Riverside Improvement Company to implement Olmsted and Vaux's plan for Riverside. Photo captured August 15, 2015. William Le Baron Jenney sure left his mark . . The color is very striking and helps to draw attention to the architectural details. Beautiful building and nice explanation and image. Thanks for sharing ! Very beautiful composition and colors . A great looking home with such interesting style in the artecheturke. A fine picture. A very beautiful image with such brilliant colors. with beautiful frame, colors, lights, shadows & textures! Gorgeous shot, Steven, of a beautiful home. We had a Schermerhorn Home in my hometown in CT in the 1940's. What a wonderful old house. It was beautiful in its day and still is. I remember living in this style of house for 3 years when I was a teen... my father was Navy and we moved to a small town. But we didn't have that beautiful verandah like in your photo... a fabulous design, love this!! Cette maison est magnifique,une très belle composition . Beautiful old house, well photographed. I don't think I adequately appreciated these old beauties when I was tooling around Riverside when I went to R-B High School. What a gorgeous home! I love the architecture and the beautiful color. Beautiful shadows from the trees. I always enjoy your shots of the architecture in your part of the continent. This is very nice. Beautiful - can't beat a wrap-around porch!